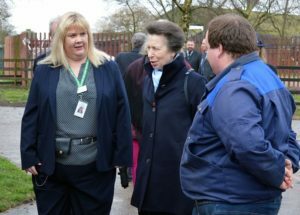 [27 March, Freiston, Lincs] In her role as Royal Patron of the Butler Trust, HRH The Princess Royal makes a number of visits to prisons, probation and youth justice settings each year, to see first hand some of the outstanding work taking place throughout the sector. This time it was the turn of HMP North Sea Camp. At the end of the visit, the Governor, Michelle Quirke, thanked The Princess for coming and invited her to unveil a plaque commemorating the occasion. In true Butler Trust tradition, she also presented HRH with some chocolate brownies (baked by her husband) for the journey home!